Right now, halfway across the globe, the world’s largest festival is taking place. We’re referring to Oktoberfest of course. The annual event in Munich lasts for more than two weeks beginning in late September and is attended by more than six million people who enjoy their fill of beer, food and other fun activities. 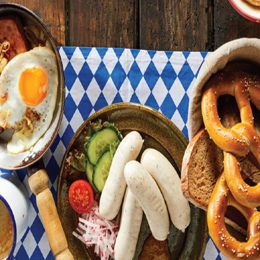 But you don’t need to be in Munich to celebrate Oktoberfest, so we’re highlighting some of South Jersey’s best dishes and drinks that pay homage to German culture. Prost! Comfort food can be defined in many ways, but when it comes to a rib-sticking, warm-you-upmeal in German cuisine, it doesn’t get much better than schnitzel. Defined as tenderized meat coated in flour, egg and bread crumbs then fried, schnitzel comes in many varieties, but jaegerschnitzel is specific to the mushroom gravy served over top. Iron Hill stays true to the roots, serving up pan-fried pork cutlets topped with a roasted mushroom sauce made with their own Wee Heavy Ale alongside herbed spaetzle (a soft egg noodle) and haricot verts. It wouldn’t be Oktoberfest without beer and there’s no shortage of ‘fest styles, but we’re fortunate to have a solid choice in our own backyard. A fall staple at this South Jersey brewery since it was first released in 2002, OktoberFish is brewed in the Marzen style with European malts, hops and yeast, and pours an amber color. The smell and flavors are perfect for fall and because it’s not overly hoppy, OktoberFish pairs well with anything on your menu. At traditional Oktoberfest celebrations, “bread women” or Brotfrauen sell giant pretzels as an antidote to drinking beer on an empty stomach. Through this inspiration we discovered this larger-than-life pretzel at Farm & Fisherman, perfect for sharing over a pint or two. This isn’t your typical South Jersey pretzel, either. The dark crusty exterior gives way to a flavorfully soft and doughy inside that’s elevated with the accompaniment of cheese fondue, bacon marmalade and hot mustard. Potato pancakes can be found all over Eastern European cuisine, largely for their simplicity and affordability. But they are also a crowd pleaser, especially for kids and vegetarians looking to take part in the Oktoberfest action. At Amy’s, their homemade potato pancakes are fried just enough for a satisfying crunch and served with the usual German sides of apple sauce and sour cream to sate a sweet or savory craving. With the abundance of meats commonly found at Oktoberfest, sandwiches are a natural offering. Broetchen are crusty, oval-shaped German rolls perfect for turning that bratwurst into a handheld meal. At Amber Grain, the broetchen are made with naturally leavened wheat and rye doughs, made by a baker who apprenticed in Dresden, Germany. In fact, most of this bread bakery’s offerings are made in the authentic German style, so you’ll have your pick of a few to add to your ‘fest table. A Vienna lager is not to be confused with an Oktoberfestbier, even though it shares the same roots. This lager is brewed specifically with Vienna malt, to which Double Nickel also adds Pilsner and Munich malts, balanced with German style hops. There are hints of toasted bread in the taste and smell, and with an ABV of 5.3 percent, it’s a good choice for riding out a few hours of your feast. When a restaurant puts “wurst” in their name, you know it has to live up to the hype. This riverfront restaurant boasts a menu full of classic German—and Polish—dishes that can please everyone in your party, but it’s the addition of their crisp-skinned bratwurst to the classic Reuben that caught our eye. Combined with corned beef, sauerkraut, German mustard and Gruyere cheese, this sandwich is a festival of flavors. Known as schwarzwalder kirschtorte in Germany, this cake is much easier to eat than pronounce. It’s more commonly known as Black Forest cake, attributed to the liquor distilled from tart cherries in that region of southwestern Germany and commonly used in the recipe. Although Sweet Eats’ version doesn’t include alcohol, it has all of the flavor. Chocolate shavings coat the outside whipped cream icing and once you cut inside, you see layers of chocolate cake, whipped cream and cherries. It puts the literal cherry on top of your Oktoberfest celebration.